DATA VAN DE DAG - Europol reported on all the terrorism attacks in 2015 today. We've combined their data for the last 5 years. It paints a bleak picture. Last year over 150 people died because of terrorism attacks in the European Union. In the 10 years the Europol now reports this is by far the highest figure. The two attacks in Paris and the attack in Brussel/Zaventem are to blame. 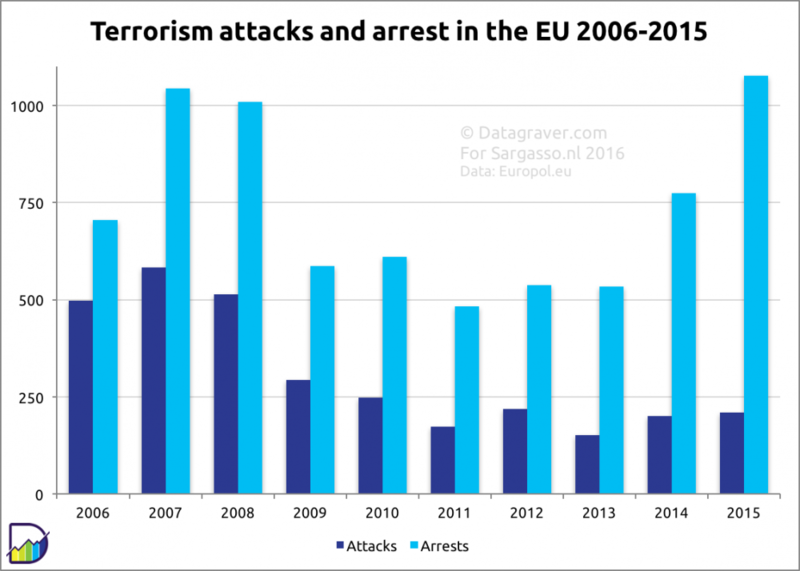 Not since London (2005) and Madrid (2004) have we seen this many deaths in the EU because of terrorism. Significant change over the last couple of years is the impact of jihadist terrorism. Only 17 of the 211 attacks in 2015 were jihadist, but it resulted in 150 of the 151 deaths. We broke down the attacks to their causes. 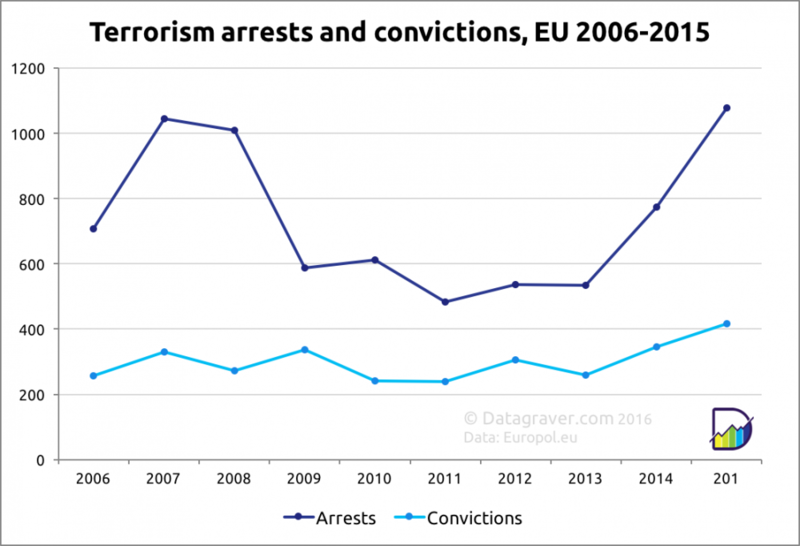 The number of terrorism related arrests grew stronger than the number of attacks. Not only did the number of arrest rose quickly, also the number of convictions rose. Large part of this rise of arrests can be attributed to arrests of jihadists. See graph below. Norway is not part of the EU, so the Breivik attack in Oslo is not included. UK doesn't report the attacks per category. They are all under "other". Deel op Facebook! Deel op Twitter! Less terrorism attacks but still many casualties last year according to the yearly Europol report. We've updated our charts. To complete our series on terrorism we created an overview on worldwide terrorism since 1970. 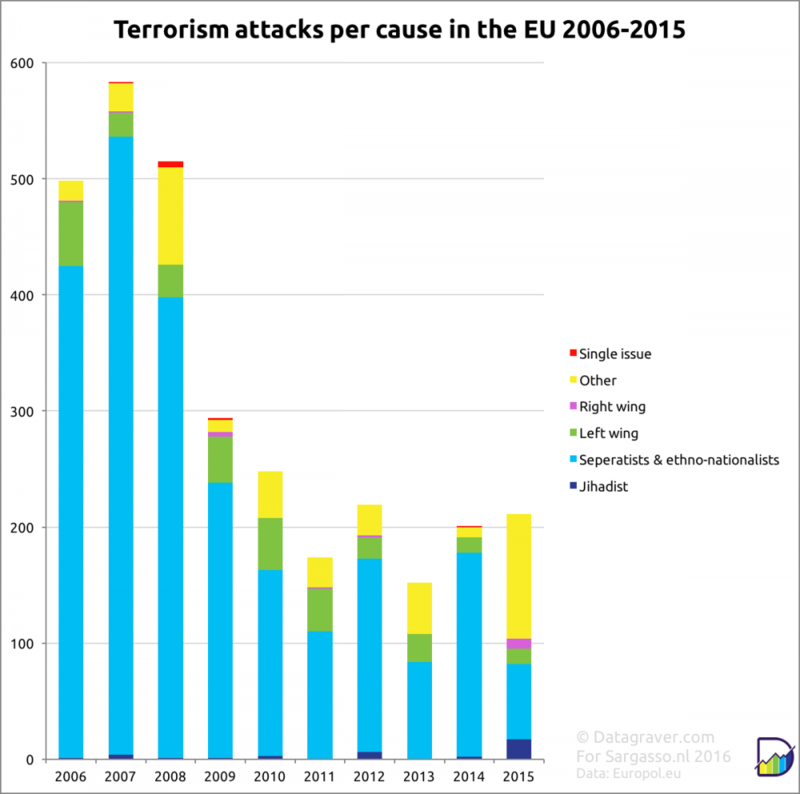 ACTUALITEIT - Because of the recent terrorism attacks in Europe we've plotted the GTD data and most recent figures in several graphs for Western Europe. DATA VAN DE DAG - Het aantal terroristische aanslagen in de EU is van 152 in 2013 naar 201 in 2014 gestegen (NB: zie update onderaan). Het aantal dodelijke slachtoffers daalde van 7 naar 4. Die vier vielen allemaal bij religieus geïnspireerd terrorisme. In dit geval islamitisch. De cijfers komen uit de net verschenen jaarlijkse rapportage van Europol.